Music Art #30. The Beatles, 1962. Today we go back to 1962 when the Beatles were spending a lot of time playing in Hamburg, Germany. Ok, I don’t know for sure what year we’re looking at here. It looks like Pete Best as the drummer and missing is Stuart Sutcliffe. Not sure if this was after his death or not. If you still don’t get yesterday’s design inspiration you can get the explanation on the Circadian Creative Facebook page where I explained it several moments ago. That’s it for today, see you tomorrow! ~Sean. Music Art #29. 1964, The Year That Changed Music. Well I have been contemplating a week dedicated to a band that I have to say is my first favorite, The Beatles. I was pressed for time today and the image I present to you below cam to me in a flash. Luckily, it was quite simple to create in a flash as well. I feel it is a perfect, simple, introductory image to kick off a Beatles tribute week. All you Beatles fans out their should get this one straight away. I will not explain the image but I encourage Beatles fans to give their interpretations and opinions below in the comments area. ~Sean. Music Art #28. Crowded House, Weather With You. 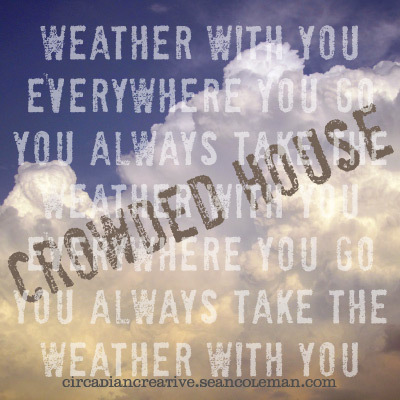 Today’s creation is for Crowded House’s song Weather With You. Very simple and literal design. I’m taking it easy today. I will point out that the background image is from a photo I shot over the summer from my balcony. It was a hot summer day which generated late afternoon thunderstorms. The imagery captures the theme of the song which is you will always carry your troubles with you like the weather. I like to think of it as you will carry your mood with you no matter what it is. In this image the spectrum of mood is covered nicely. The blue sky and top of the clouds represents pleasant mood but within and below are less favorable condition which can represent sadness and even anger. That’s it for today. ~Sean. Music Art #27. Radiohead, Creep. Here is today’s design. I picked Radiohead’s hit single Creep. The song as I interpret it is about an outsider who does no or can not conform to many of the customs of society. The person, rather than seeing himself as simply an individual sees himself as a creep. I might be off in my interpretation but given my description I believe this design conveys the idea of someone standing out from the crowd. Hope you like! ~Sean. Music Art #26. The Grateful Dead, Box Of Rain. 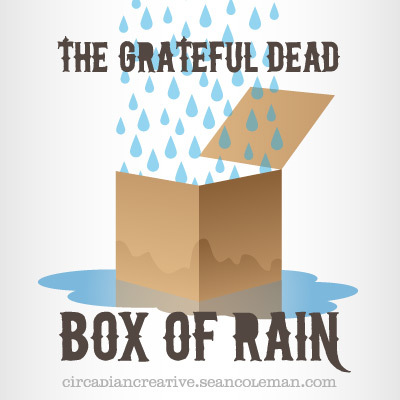 Today’s music inspired design is for The Grateful Dead’s song Box Of Rain. This is perhaps my favorite Grateful Dead song. I always thought the song was a metaphor for birth life and death and perhaps I am correct. I researched the song this morning and it appears that the song was written by Phil Lesh and Robert Hunter during the time that Phil’s father was dying from cancer. Lesh had been thinking that he would like to write a song that he could sing to his father during hospital visits. He eventually worked out the melody, recorded it and turned it over to Robert Hunter for lyrics. Hunter said that if there was ever a song that wrote itself, this one was it. As he listened to the tape he said the lyrics just came to the paper as fast as his pen could push. I chose to create an illustration of the metaphor. Life is portrayed as a box that fills up with rain over time and then empties out in death. At least that is how I interpret the song. The point is that the time we are here is short compared to the time we are not here. A box will not hold water forever. I chose simple imagery. The typography is organic or grungy which is congruent with the style of the band and it’s music. That’s it, I hope you like! See you all tomorrow. ~Sean. Music Art #25. 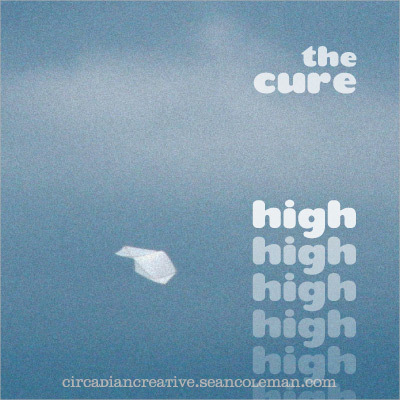 The Cure, High. Today’s post is the final Cure design. I went very clean with this one. I used another of my photos, this one is cropped in on a kite which is flying over Virginia Beach. The day of the photo shoot was actually cloudy and gray but I altered the image to give it a bluish cast. I chose a clean display type to set the name of the band and the title of the song. I also repeated the song title, stacking each instance of it and using a range of transparency to give an impression of motion as if the title is rising up into the sky. Ah, simplicity. Thanks again to all the visiting Cure fans! I’m very happy you’ve enjoyed these designs and I really appreciate the great feedback you’ve all posted on The Cure forums. See you all tomorrow with another band or solo artist!~Sean. Music Art #24. 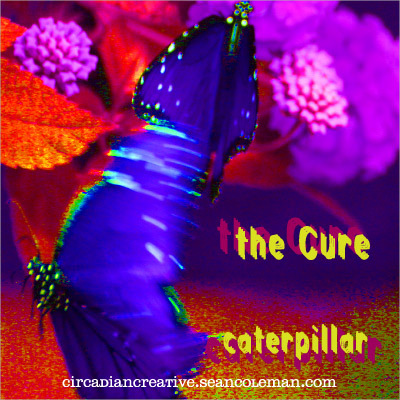 The Cure, Caterpillar. Again, a warm welcome to all the Cure fans visiting from www.thecure.com. Hope you enjoy your visit! Just like the past 2 designs, this one features a photo taken by yours truly. Of course it has been heavily photoshopped for the saturated effect. I used the same typeface as yesterday’s design. The song Caterpillar is more upbeat so I feel the vibrant color is appropriate. If you know the song and the lyrics I think you will agree that the imagery matches nicely. I think this is my favorite Cure design so far! I hope you like it too! See you all tomorrow. ~Sean.